Corby is a bustling area, with the fastest growing population in England. Centrally located and with a wealth of industrial estates and a rich quarrying, steel working and business history, Corby is a popular location with many permanent residents, visitors and businesses establishing roots in the area. Corby has a lot of green spaces, parks, hiking trails and woodland, which give the area a bright, natural atmosphere. Corby’s Hazel & Thoroughsale Woods have been awarded the Green Flag for five consecutive years, making Corby a key area for landscaping, horticulture and grounds maintenance. Corby is a large town, boasting a total of 48 schools, 14 care homes, multiple outdoor sports centres and sizeable golf courses – these are key to the ambience of Corby – well-maintained commercial spaces complete the town’s polished image. At Ricky Tyler, we also know that security is of the highest importance when it comes to maintaining the grounds of Corby’s schools and residential facilities, which is why all our staff are DBS checked. Commercial land in Corby with unruly gardens, weeds and a lack of maintenance let the whole area down, as well as making the business less favourable when compared to similar businesses with appealing surroundings and relaxing spaces. We know that maintaining grounds of any size can be worrying and time-consuming, so we offer a range of packages to suit all needs – from one-off visits to tidy things up, to ongoing grounds maintenance. Many streets in Corby boast open green spaces, well maintained green strips and neat hedges, flowerbeds and tidy lawns. Failing to regularly maintain your garden may create issues with neighbours, tarnish the overall image of the area and will appear plainly unattractive. Whilst a nice, tidy, well-maintained garden lifts your mood when you get home, improves the value of the property and helps the local area to look and feel more welcoming. 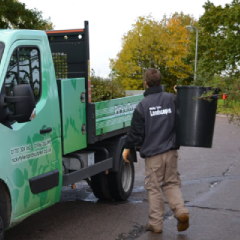 Ricky Tyler landscapes offer a wide range of residential grounds maintenance services in Corby and the surrounding areas, including; Cottingham, Rockingham, Little Oakley, Great Oakley and Weldon. No matter the status of your garden – whether a one-off boost to return the life to your property is needed, or a long-term care plan – we can bring the best out of your garden. We offer lawn care and turfing, weeding and hedge maintenance services, so we can guarantee that your garden will be the best in Corby. Our service is completely flexible - we work around your schedule and to suit your exact garden maintenance needs. 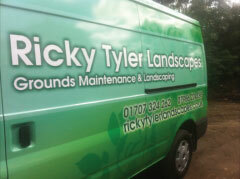 Ricky Tyler Landscapes can provide gardening and grounds maintenance services including Corby Grounds Maintenance covering Corby, Northamptonshire .